Activity Advent – Homemade chocolate Christmas tree decorations…. Last year, the kids pestered me every time we went shopping in December to buy some chocolate decorations for our Christmas tree but I kept saying no as I really do begrudge paying £3 for just 9 little chocolates. In the end though, we decided to make our own versions which not only saved us a little bit of money, it meant that our chocolates were bigger and we had fun making them. We bought 12 of those Cadburys Magical Elves which if I remember rightly cost 20p each but were on offer at six for £1 and sellotaped a little bit of Christmas tree lametta to the back of it in a loop and voila, 12 hanging chocolate decorations for £2.00. You could use plenty of other things too if you wanted to make your own versions. Anything from the sweet aisle would be fine as long as it’s wrapped. You could make smaller ones if you had a box of Roses or Quality Street around or some classy (but probably more expensive) ones using Ferrero Rocher. 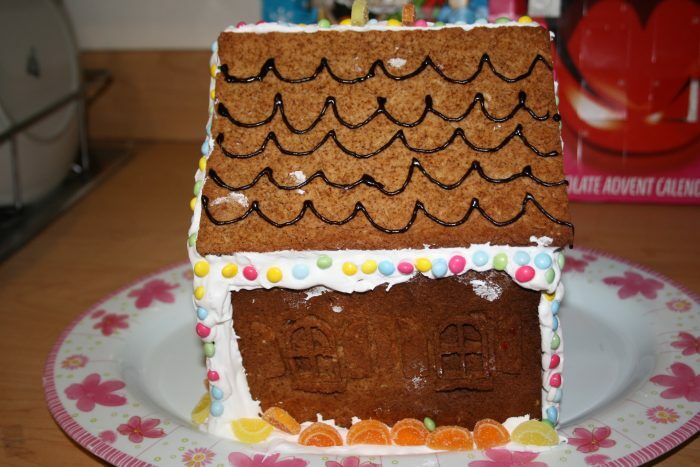 Activity Advent – Make a Gingerbread house…. 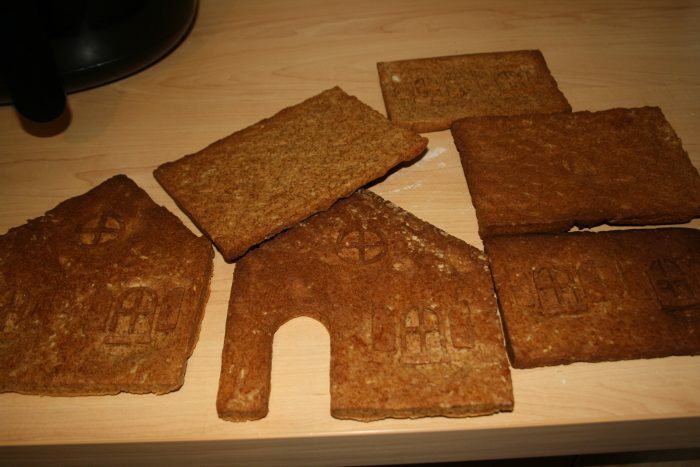 In this house, Christmas isn’t Christmas without gingerbread in some form or another! Add the flour, the butter and the bicarbonate of soda to a large mixing bowl. 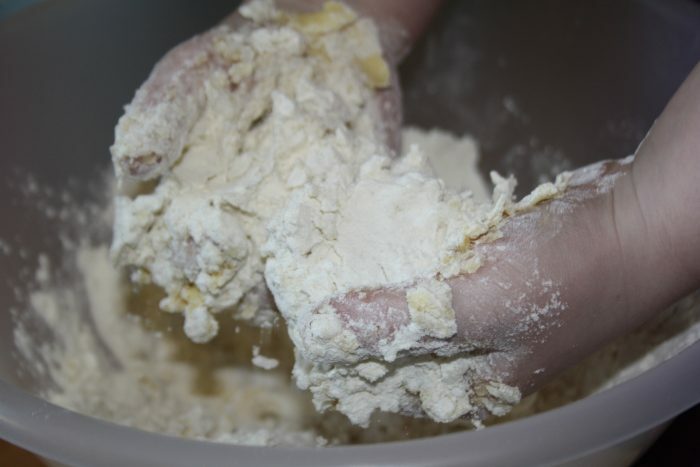 Get your hands in there and rub the butter into the flour until the mixture looks like breadcrumbs. Next, add the rest of the ingredients and knead until everything is combined and you have an easy to work with ball of dough. Wrap your dough in cling film and chill in the fridge for at least two hours, removing it about 10 minutes before you’ll be working with it. On a floured surface roll out your dough until it is about the thickness of 2 £1 coins. 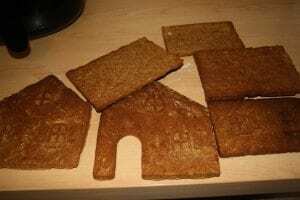 Now you need to make the shapes that will eventually become your house, I have a gingerbread house mould but it would be just as easy to print out this template and cut out the shapes you need. 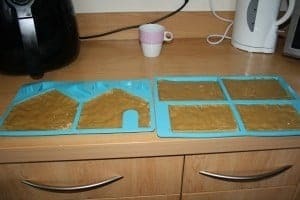 When your house is completely cool, you can move on to making the icing that’s going to hold everything together. We used an electric whisker to whisk the icing sugar and the egg whites until they are at the soft peak stage, this is the one bit I didn’t let Miss Frugal help with – no idea when she’ll be old enough to be allowed to use that – probably about 21! You may need to add some extra icing sugar to get the icing thick enough – I had to add a few spoons more but then again, I used large eggs. Now for the hard bit – sticking it together and managing to make it stay standing! We started by piping the icing on to the bottom of one of the end pieces and then sticking it on to the large plate I was using as the base. We used two small vases to put on either side of it to anchor it in place and then attached one of the sides and the other end. I wouldn’t have been able to manage without my vases as Miss Frugal’s hands weren’t steady enough to hold the walls in place, you could use tins or anything to anchor your walls. The icing sets quite quick and really does hold it together so the trick is to use as much icing as you can on the edges of every piece. After the walls have been standing for an hour or so (we were impatient and only waited 20 minutes) you can attach the roof pieces, again using lots of icing. As I couldn’t figure out a way to anchor these while the icing set, we did one piece at a time and took it in turns to hold the piece in place – my turn obviously lasting way longer than Miss Frugals! After the roof has set, you’re ready to get decorating…. It’s definitely not as perfect as it could be but we had lots of fun making it which is what it’s all about, isn’t it? Activity Advent – Lolly stick tree decorations…. Easy peasy – glue three green lolly sticks together in a triangle shape and when it’s dry, glue a loop of ribbon to the top of it so you can hang the finished decoration on the tree. Next you just need to decorate your lolly tree with anything you have – ribbon, sequins, pom poms, random sticky shapes…. Anything! Activity Advent – Make a paper Christmas Wreath…. Christmas isn’t Christmas without a wreath, is it? We have a lovely homemade wreath that Jen made us last year with dried orange slices, cinnamon sticks and a big lovely red bow on it but the kids wanted to make their own version so we decided to make a paper one of our own. As with most things we make, this is really simple to make and the kids can get as creative as they want which is the idea of Christmas crafting. First you need to cut our a circle of card like in the first picture. I used green card but it doesn’t really matter as i gets covered up anyway so a folded out cereal box or card from a cardboard box would be OK too. I used a dinner plate and casserole dish lid to draw around for mine. Next you need to cut out some leaf shapes which is the fiddly bit. I used sheets of green A4 paper and *may* have cheated a bit here as I folded each sheet of paper in half 3 times so I was cutting out 8 shapes at a time. Then you can start sticking – my eight year old did all the sticking himself because it’s almost impossible to go wrong. I just told him to go around the wreath following the pattern of one leaf pointing out one way, one leaf straight forward and the other leaf pointing out the other way like in the picture above. The final part is the decorating which is where it gets messy. We used a bit of glitter, some sticky shapes we had and added a lovely green ribbon at the top and I think the finished result looks lovely blu tac’ed to the door downstairs…. While we had the glitter out we decided to make a few decorations for the tree by drawing around some Christmas cookie cutters and decorating the shapes. We glued some ribbon to the back and now they’re hanging on our tree making it look all sparkly…. There’s lots more Christmas Craft ideas here if you want to see what you can make. Disclosure: we were sent a lovely craft pack to help us enjoy our Christmas crafting. 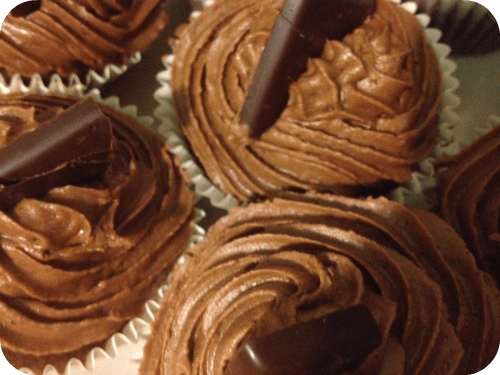 After Eights (along with Baileys, Advocaat and Chocolate Oranges) are things that I only really buy at Christmas so when I was trying to think of what I would use to make some Christmassy cupcakes, I decided to go with After Eight themed cakes. I bought the supermarket’s own make though as I didn’t know how they’d turn out and I would have been gutted if they’d turned out wrong and I’d wasted a whole pack of After Eights! They were only 99p and to be honest they tasted exactly the same as the usual ones so I’ll be buying them in future anyway! Cream the sugar and the butter together. Beat in the eggs, milk and vanilla essence. Gently fold in the flour and the cocoa. Add the After Eight pieces. 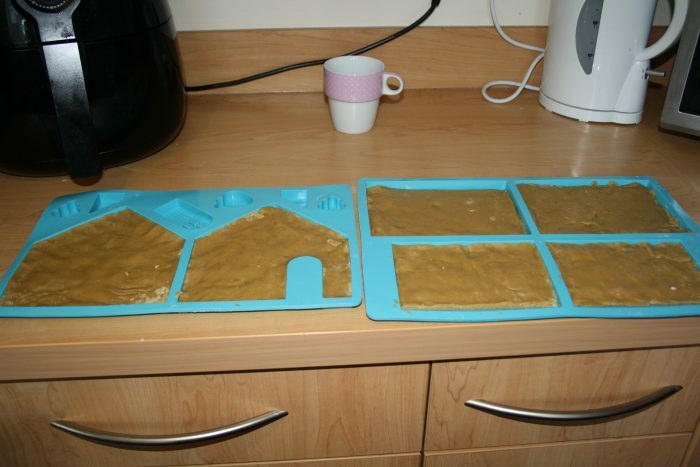 Spoon into cake cases and bake them in an oven heat to around 180 c for about 1 5 – 18 minutes. I iced them with my super amazing chocolate buttercream icing and added a quarter of an After Eight mint to each one to decorate.